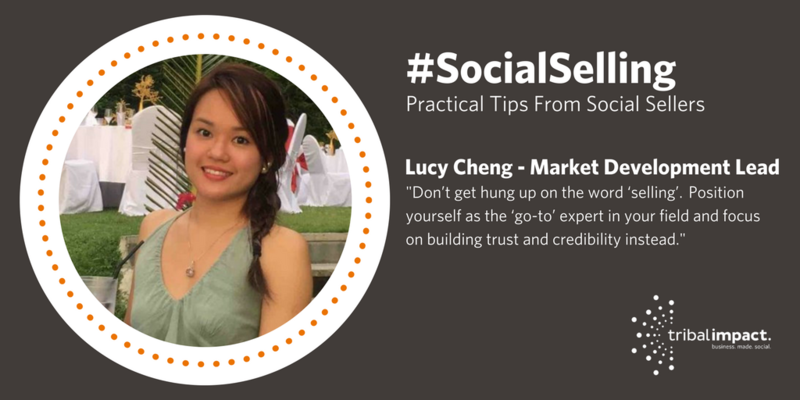 My latest Social Selling interview took me to Singapore (not literally) chatting with converted Social Seller, Lucy Cheng. What I love most about this interview is that Lucy went into Social Selling convinced it was just another channel for finding new business. Twelve months on, she realised the true power of the Social Selling. In this post, Lucy shares some practical tips and tools to help you "focus on building trust and credibility" with your network. I work at Concur, an SAP company. I’m based in Singapore and cover the Asia region as a quota-carrying Market Development Representative. My role is to build my pipeline within the South-east Asian region and I’ve been doing it now for just under two years. What is your perspective on Social Selling? It’s changed completely within a year. Originally, I thought it was another channel for generating business but, actually, it’s more about developing your brand through thought-leadership. People want to understand what is going on in their industry so it’s about positioning myself as the go-to expert who can provide this knowledge. I regularly share content and then reach out to those who interact with it to find out whether they’d like to connect. But I don’t mention Concur otherwise people shut down. They don’t want to be sold to or hassled. Buyers just want to be informed. So I just ask them to reach out when they’re ready and I’ve found I get more referrals as a result. Just out of curiosity, what’s your LinkedIn SSI score? Let me check – today it’s 84. I do regularly keep track of this as it helps me target my time and see whether I need to invest more effort in sharing content or engaging with others. How do you fit Social Selling into your working day? I use LinkedIn Sales Navigator a lot to filter my target audience. It’s a great way to identify people within my region and target sectors. I also use Hootsuite to schedule content to my LinkedIn account. I normally share content twice a week – on a Friday usually, between midday and two p.m, when I know people are checking in over lunch. In terms of time spent engaging with people, this is split between those at the early stage of relationship building: I look at who has viewed my profile and message them to find out whether they want to know more and I also engage with their posts with the help of Sales Navigator; and those with whom I have deeper links: I look for relevant updates from the market and send them targeted messages using InMail so that I can share relevant and specific content. This really goes a long way to strengthening relationships. I also use a local employee advocacy tool called Elevate. This sends me specific content, which I know is relevant to my audience. Has Social Selling yielded new business for you? We had a customer in France using Concur. When I found out, I approached the customer via InMail and told them that I regularly posted content that they might be interested in. That resulted in a connection being made and we are now involved in more detailed discussions. What’s your advice to people who aren’t Social Selling? Firstly, I would say don’t get hung up on the word ‘selling’. People now place such a high value on relationships; it just isn’t about selling anymore. By the time I talk to a buyer, 50-60% of the research has already been done so what’s the point of then trying to sell to them? Hassling and pushing buyers doesn’t work because it turns people off. It’s about positioning yourself as the ‘go-to’ expert in your field. Focus on building trust and credibility. As Lucy explains, the power of content and positioning is key when it comes to Social Selling. There is no doubt that being smart with your routine, staying tuned in with your buyers interests and positioning your professional brand as the go-to-expert is key to winning trust and credibility.